In his last game with the Red Sox, Juan Nieves (left) made a mound visit Wednesday to confer with Justin Masterson. 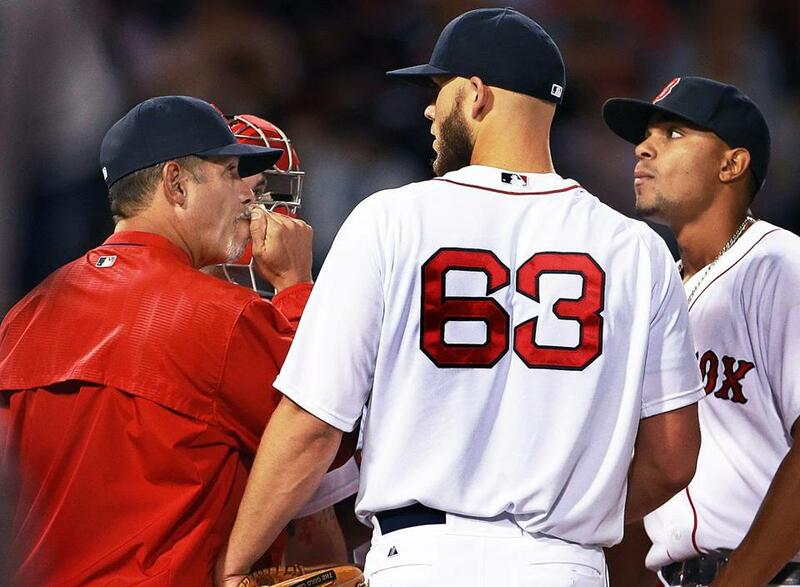 The weight of the Red Sox’ early season struggles with their starting rotation ultimately fell on pitching coach Juan Nieves, who was fired Thursday, barely a month into his third season with the team. Plagued by inconsistency and doomed by big innings, the Boston starters have been the worst in the American League with a 5.54 ERA, and with the Sox sitting in last place in the AL East, general manger Ben Cherington and manager John Farrell felt an urgency to make a change. Farrell has known Nieves since 1986, when they both pitched for San Juan in the Puerto Rican winter league, so the decision was difficult for him. They had become close friends and saw the game the same way, leading Farrell to handpick Nieves as his pitching coach when he became manager in 2013. That year, the Sox staff compiled the sixth-best ERA in baseball (3.79) on its way to a World Series title. Two years later, the starters have given up 99 runs collectively, the most in baseball, throwing just 154⅓ innings, 22d in the majors. The only starter on the staff with a sub-5.00 ERA is Rick Porcello (4.38). The Sox have a working list of candidates to replace Nieves, both internally and externally, Cherington said. Fox Sports’ Ken Rosenthal reported that Indians Triple A pitching coach Carl Willis was among them. Pawtucket pitching coach Bob Kipper, well-respected over his 15 years in the Sox farm system, also could be a possibility. But Cherington was uncertain whether a new pitching coach would be named by Friday, when the Sox open a three-game series with the Blue Jays in Toronto, the start of a 10-game road trip. If no pitching coach is in place, Cherington said, Farrell and his remaining coaching staff will assume the duties. “I think once we came to the conclusion after a lot of deliberation and discussion, we felt like the right thing to do is to make the move even though we knew that we would have to work on the replacement,” Cherington said. When Nieves arrived, he was a stabilizing presence for a staff that had burned through three pitching coaches the previous two seasons. But what allowed him to connect with the staff then wasn’t resonating the same way now, Farrell said. “There’s a number of things that go into this, but the ability to maintain the consistency or affect change when needed or adjustments that are required that’s typical with any pitcher, that wasn’t the same as we saw two years ago,” Farrell said. Despite being in the top 10 in runs scored, the Red Sox’ offense has been undermined by the pitching. Starters have consistently put the Red Sox in a hole, forcing them to play from behind in 19 of 28 games so far. Seven times, Sox starters have failed to make it out of the fifth inning. “The biggest thing is that the pitching coach has to have the ability to connect and gain trust — and when I say that, that’s not to solely suggest that’s the reason why we made a change here,” Farrell said. “But I think the role of a pitching coach is one that he’s got to be able to see the current picture of what a pitcher is, what that vision might be, how they improve, and the steps needed to get to that point. It’s in combination with building that rapport, keeping the credibility of the message, and that’s just as it relates to the individual pitcher and his overall growth and development. “The other thing is to be able to outline a game plan — and these are all aspects of the pitching coach position — outline a game plan, communicate it effectively, and if there’s adjustments needed in the moment, those are all things that are pretty routine to the position. When the rotation was assembled in the offseason, there was no identifiable ace, and each pitcher seemed like a unique puzzle. Nieves had the challenge of harnessing Joe Kelly’s remarkable fastball and tapping into the breakneck pace that made Wade Miley a 30-start, 200-inning workhorse the past two seasons. He also needed to solve the issues that marred Clay Buchholz’s 2014 season and get Justin Masterson back to the pitcher who won 14 games for the Indians two seasons ago. The Sox are 4½ games behind the first-place Yankees in the division, and Cherington reaffirmed that the pitching staff will eventually improve. Follow Julian Benbow on Twitter at @julianbenbow.